Thanks to the Minister of Foreign Affairs & International Trade in Argentina, Malbec World Day was made official in April 17, 2011. This commemorated the day President Sarmiento of Argentina made it a mission to transform Argentina’s wine industry in 1853. Here he appointed soil experts to bring over new vines, amongst them was Malbec. Long cultivated in the southwest of France, it enjoyed increasing awareness since the reign of the Roman Empire. Over the years Malbec flourished all across Argentina creating wines far superior than those from the original vines! Taking a step back, Malbec is a grape variety used in producing red wines. What sets Malbec apart is their plump, and inky dark fruit flavours with robust tannins that give you a smoky finish. Grown around the world, it is progressively celebrated as an Argentine varietal wine for its major success. Malbec also offers a great alternative to the higher priced likes of Cabernet Sauvignon or Syrah. 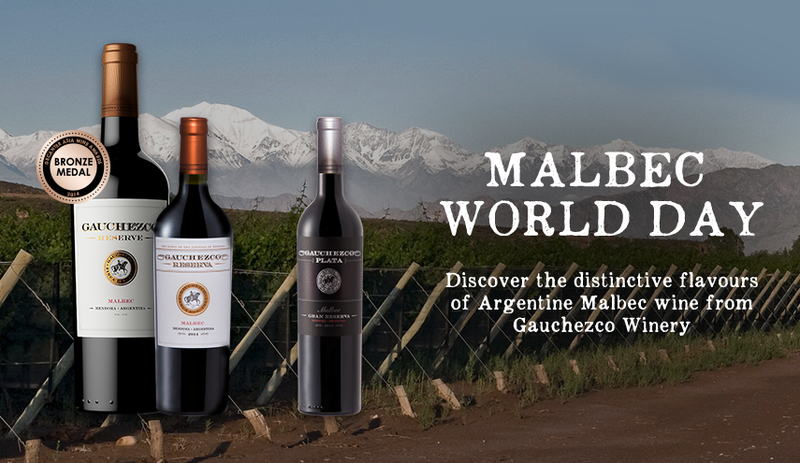 Between the many Malbec wineries in Argentina, lies the Gauchezco Vineyard. Produced in Barrancas – Maipu and the Uco Valley, Gauchezco was established in 1881, just off the city of Mendoza. Their grapes of premium quality experience a dry desert climate, where days are sunny and nights are chilly as they rest upon alluvial chalk-rich soils. Gauchezco "Reserva" Malbec is a premium range of exclusive varietals that integrates the best of Argentine viticulture tradition in a modern styled wine. The Malbec displays deep red in colour having drapes of violet with an elegant yet complex flavour of dark berry fruits. This leaves you with a nice finish of plum, raspberry ganache and blackberry on your palate. It’s also well balanced and concentrated with well-rounded tannins emphasising its personality. This wine deliciously pairs up with red meats, pasta and fine fermented cheeses. Consider grabbing this wonder to celebrate the life of Malbec! The ‘Plata’ in Gauchezco Plata Malbec represents the conviction, imagination and richness of the Mendoza terroir. With vigorous red and violet hues, the thought is shown through their intense and attractive aromas of cherry and plum combined with an elegant essence from the oak. The intensity leaves you with a juicy finish, with a mouthfeel that is silky and profound. This is also enjoyed with similar food pairings and works perfectly for this magnificent day. So why not grab a glass and sample this bottle in honour of Malbec. If you want to explore Malbec wines elsewhere you can sample a bottle from our exciting Trivento Malbec range including Trivento “Amado Sur” Malbec, Trivento “Birds & Bees” and Trivento Golden Reserve Malbec. We also have individual Malbec wine brands giving you plenty to choose between! Don’t forget to check out our wines online to make your purchases, or find your nearest store today.